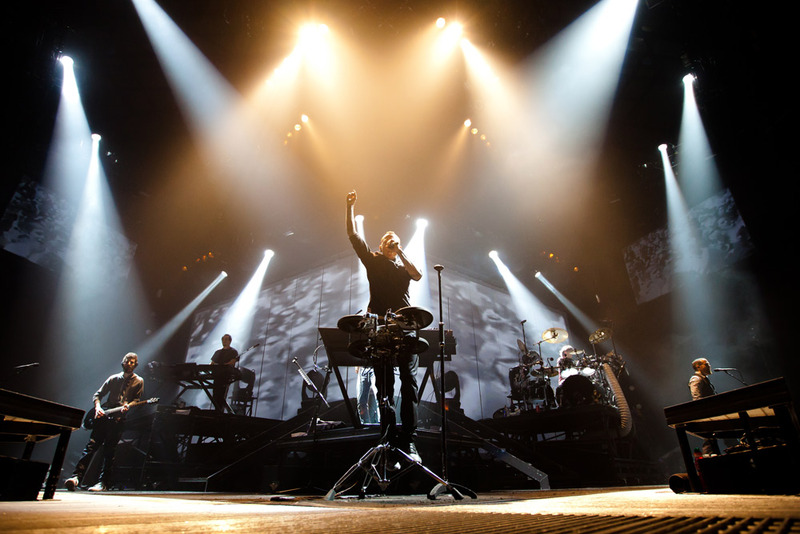 A J Pen, lighting designer for Linkin Park, was recently introduced to the Martin M1 lighting controller by his programmer for the current tour Seth Robinson. A J was impressed by the console and describes it as well laid out so he specified one for the tour. However, apart from the odd bit of new programming A J never actually touches his console during the entire performance! How does he do that? A J has an interesting and novel system where he has strung together a bunch of things in what seems at first to be a complicated way to achieve a simple result. A J has live input via a keyboard controller, a Behringer BCF fader board and an Ovation launch pad. ”Every Linkin Park song has a chunk of time-code that is its own and we work that out with Dylan, our Pro Tools guy, so if I get a certain frame number I know what song it is,” added A J. “That in turn fires the macro on the M1 console to set up that song. It also tells it that a certain range of cue lists is what will be mapped for that song. So we are taking note number information and control change information, which is provided by either live input from the control surfaces or from the Ableton time line. “For example, instead of writing a chase where each step is a different group of lights I take four or five MIDI note number, I play the chase into the Ableton time line and that translates it into MIDI show control. As well as seven Martin MAC 2000 Performance™ and twenty-four Martin Atomic 3000™ strobes, A J was also using eighteen Martin MAC III Profiles™.